First published in 1850, New York by Gas-Light explores the seamy side of the newly emerging metropolis: "the festivities of prostitution, the orgies of pauperism, the haunts of theft and murder, the scenes of drunkenness and beastly debauch, and all the sad realities that go to make up the lower stratum—the underground story—of life in New York!" The author of this lively and fascinating little book, which both attracted and offended large numbers of readers in Victorian America, was George G. Foster, reporter for Horace Greeley's influential New York Tribune, social commentator, poet, and man about town. Foster drew on his daily and nightly rambles through the city's streets and among the characters of the urban demi-monde to produce a sensationalized but extraordinarily revealing portrait of New York at the moment it was emerging as a major metropolis. 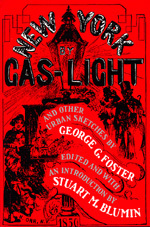 Reprinted here with sketches from two of Foster's other books, New York by Gas-Light will be welcomed by students of urban social history, popular culture, literature, and journalism. Editor Stuart M. Blumin has provided a penetrating introductory essay that sets Foster's life and work in the contexts of the growing city, the development of the mass-distribution publishing industry, the evolving literary genre of urban sensationalism, and the wider culture of Victorian America. This is an important reintroduction to a significant but neglected work, a prologue to the urban realism that would flourish later in the fiction of Stephen Crane, the painting of George Bellows, and the journalism of Jacob Riis. Stuart M. Blumin is Professor of American History at Cornell University, and the author of The Emergence of the Middle Class: Social Experience in the American City, 1760-1900 (1989).